Two marine scientists say shutting down the U.S. fin trade entirely would remove a model of sustainability for the rest of the world. Democratic Sen. Cory Booker of New Jersey introduced a bill this year designed to prevent people from possessing or selling shark fins in America, much to the delight of conservation groups such as Oceana. But marine scientists David Shiffman and Robert Hueter said this approach could be wrongheaded. Shiffman and Hueter authored a study that appears in the November issue of the journal Marine Policy, saying that the U.S. has long been a leader in shark fisheries management and that shutting down the U.S. fin trade entirely would remove a model for sustainability for the rest of the world. The U.S. also is a minor contributor to the worldwide shark fin trade, and countries with less regulated fisheries would likely step in to fill the void if America left the business altogether, Shiffman said. Shark fins are most often used in a soup considered a delicacy in Asia. 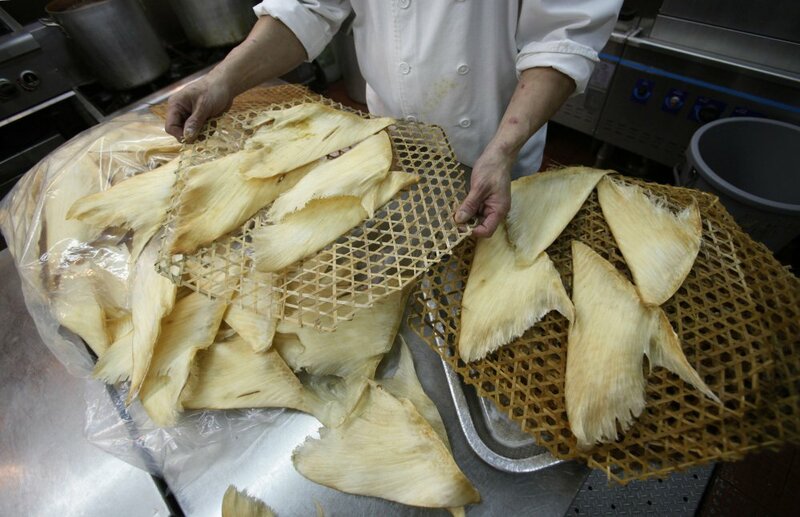 Shark fins that American fishermen harvest are often shipped to Asia for processing. Environmentalists and animal advocates have long blamed shark fin soup for the decline of certain shark species. Their criticism of shark fin soup often includes arguments against “finning,” which is a practice that’s illegal in the United States and involves removing the fins from recently caught, often live sharks and discarding the animals. Nearly a quarter of U.S. states have bans in place on the sale of fins, and sharks were afforded new protections with the Shark Conservation Act of 2010. But the country still has hundreds of shark fishermen, and they are allowed to have the shark’s fins removed for sale during processing on land. Booker’s proposal would change that, making it illegal for any person to “possess, transport, offer for sale, sell, or purchase shark fins or products containing shark fins.” The bill was approved by a commerce and science committee in May, and a similar bill has been proposed in the House of Representatives. More than 100 scientists have endorsed the bill, said Kristin Lynch, a spokeswoman for Booker. “Unfortunately, current laws have proven inadequate at stopping the trade of fins from threatened and endangered sharks,” she said. Marine conservation group Oceana is standing by Booker’s proposal, said Lora Snyder, a campaign director for the group. Shutting down the fin trade is akin to getting the U.S. out of the ivory business, she said. A “near total” ban on commercial elephant ivory took hold in the U.S. last year, according to the U.S. Fish & Wildlife Service. The U.S. fin trade needs to be shut down in part because violations of the “finning” ban have continued to take place, Snyder said. An investigation by Booker’s office earlier this year showed that the National Oceanic and Atmospheric Administration has investigated more than 500 incidents of alleged shark finning since 2010. Some commercial fishing groups have vowed to fight efforts to shut down the fin trade. About a quarter of the value of a shark is in its fins, and the rest is in its meat, Shiffman and Hueter’s study said. That means the fin ban is essentially an effort to shut down shark fishing altogether, said Jeff Oden, a Hatteras, North Carolina, fisherman who started fishing for sharks about 30 years ago.